Announce ‘Decades’ UK Tour 2018! Finnish symphonic metal gods NIGHTWISH released their brand new best-of compilation ‘Decades’ on March 9th through Nuclear Blast to celebrate more than two decades of their career. It's only right, then, that this milestone should be celebrated with an extensive world tour! Currently touring North America, the band are pleased to announce that they will be bringing the tour to the UK in December. This will also be the band’s first UK tour since 2012, so these shows are absolutely not to be missed. 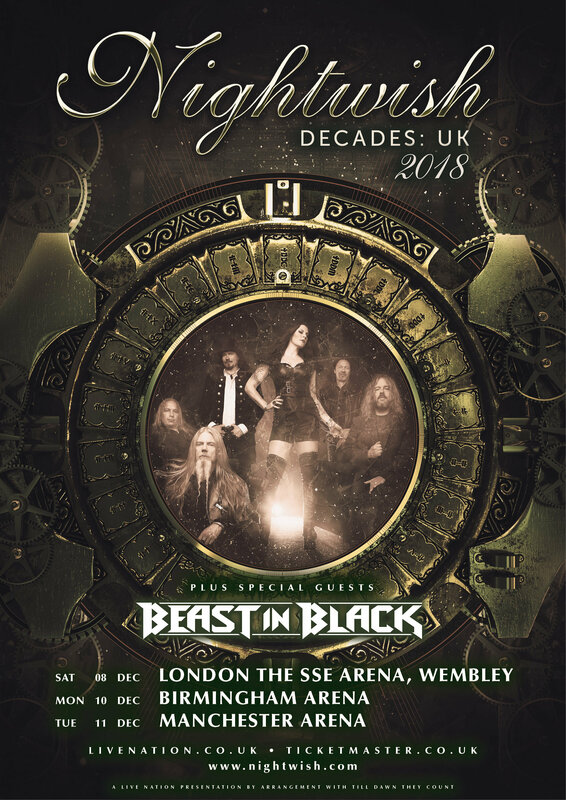 They have also revealed that special guests will be up and coming heavy metallers and label mates BEAST IN BLACK, led by former BATTLE BEAST guitarist Anton Kabanen. Full tour dates are below. Let's light the British Beacons!" Let's be honest; it doesn't take any overstated words to present this exceptional band called NIGHTWISH to the world out there, for they are the undisputed pioneers of symphonic metal and the icons of a whole genre. Their virtuosity is consummate perfection, their inspiration lived passion! NIGHTWISH truly understand how to captivate and enchant within seconds. Since the beginning of their career which started on a mild summer night in July 1996, they have been regarded as the epitome of the most demanding, compositional music art and innovative sound ventures. ‘Decades’ unites the most important songs of the band on two CD's in their original versions. The Suomi sound makers have always been recognised for their exciting journey of discovery and as a tribute to all that, this release presents a phenomenal cross-section of this formidable career through the lens of their grandiose evolution!